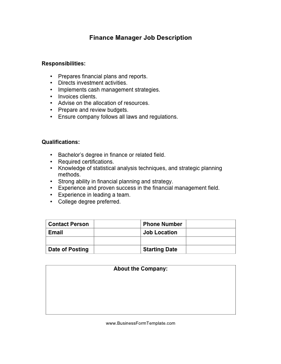 This finance manager job description outlines the work responsibilities and educational requirements in order for a candidate to fill a management position. Prepares financial plans and reports. Advise on the allocation of resources. Ensure company follows all laws and regulations. Knowledge of statistical analysis techniques, and strategic planning methods. Strong ability in financial planning and strategy. Experience and proven success in the financial management field.